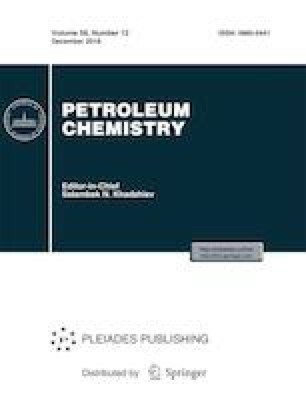 Asphaltenes and solid paraffins isolated from various layers of acidic water-oil emulsions obtained by mixing an oilfield emulsion with 15% solutions of hydrochloric and sulfamic acids with or without addition of Fe(III) have been studied by elemental analysis, IR and EPR spectroscopy, gas–liquid chromatography, and calorimetry. In acidic water-oil emulsions, the high-molecular-weight petroleum components have not been found to concentrate at the oil/water interface; however, a change in their composition has been revealed, which is more pronounced in the presence of Fe(III). The formation of diamagnetic complexes of the paramagnetic centers of asphaltenes with Fe(III) has been detected.